The knowledge accumulated through years of experience in engineering brakes for race cars has led the Brembo High Performance Division to launch the exclusive GT-R line. 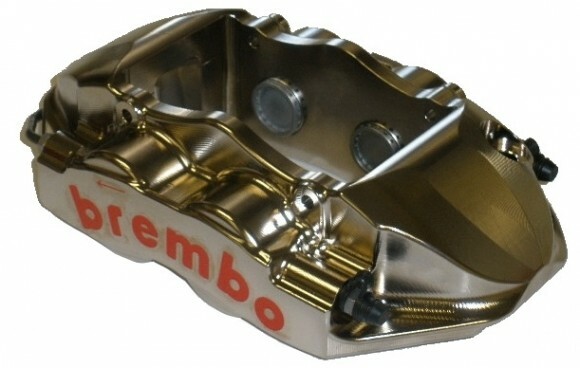 It has been developed to fit a select number of street applications including but not limited to Porsche, Ferrari, BMW, Chevrolet Corvette and new Camaro applications. The new Brembo GT-R systems have been designed for the driver who demands exceptional performance on the street or on the track. Systems include 4 or 6-piston monobloc calipers, two-piece floating brake rotors, a selection of friction materials and all the necessary hardware to insure seamless installation. The GT-R calipers are machined entirely from billet aluminum in order to provide both the benefits and look of a racing brake system: more stiffness, lighter weight (GT-R calipers achieve a weight reduction up to 10 percent compared to cast versions) and more thermo-mechanical resistance, critical in high-performance applications. The nickel-plated finish provides additional treatment against corrosion and provides an unparalleled appearance. The pistons, complete with stainless steel inserts, provide an additional heat barrier virtually eliminating fade even during max-limit and on-track driving. In addition, the calipers provide less brake fluid absorption and a stiffer pedal feel delivering consistent clamping force suited for drivers wanting to make the most of every second. The new Brembo GT-R brake systems are available with drilled or slotted two-piece floating rotors which reduce un-sprung weight and dissipate heat faster.